"The observations that we make as geologists, and observational climatologists, do not show any evidence that human beings are causing this. Now, there is a whole bunch of unknowns..."
The title of the session was “Apollo Plus 50,” and the focus was the past and the future of America’s space program in light of the 50th anniversary of the Apollo moon missions. Fifty years ago today, for example, Apollo 7’s astronauts were putting NASA’s moonship to the test for the very first time in Earth orbit. Schmitt’s an expert on this subject, primarily because he was the last of 12 humans to set foot on the lunar surface, during the final Apollo mission in December 1972. He also served as a U.S. senator from New Mexico for a single six-year term, and is currently a member of the National Space Council’s Users Advisory Group. He’s known as the first professional scientist to go into space, by virtue of his Ph.D. in geology. At the age of 83, he keeps his hand in as an adjunct professor of engineering physics at the University of Wisconsin at Madison, focusing on fusion research (and the potential for using lunar helium-3 as a future fusion fuel). I was the organizer of today’s session at George Washington University, which was moderated by Jeffrey Kluger, Time magazine’s editor-at-large for science and technology. Schmitt’s fellow panelists included Valerie Neal, a curator specializing in space history at the Smithsonian’s National Air and Space Museum; and Scott Pace, executive secretary of the White House’s National Space Council. In my view, there are few people better qualified to reflect on the Apollo anniversary than Schmitt. (Yes, there are three other living moonwalkers, but Schmitt was the one who answered the call.) I knew about the climate contretemps, but didn’t think it’d figure in the space discussion. You can check out the funky video I recorded to catch up with the whole session … including the part about space. Flashback: Oops! 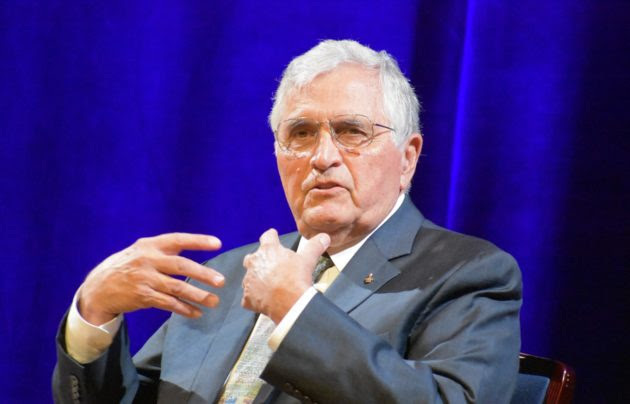 Inconvenient Astronaut: NASA Moonwalker Schmitt Defies Gore’s Claim — Declares Himself a Skeptic!